What is Yoga? 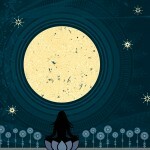 written by Nancy Weshkoff | Moonflower Yoga Inc. When people think of yoga their first image is often of someone doing a yoga asana pose such as a downward facing dog or a headstand. Patanjali, considered the father of yoga and the author of the Yoga Sutras, described yoga as “yogas citta vrtti nirodhah” which translates to “yoga is the calming of the changing fluctuations of the mind”. So what does that mean? Many of the things that we do in our yoga practice including the movement in a yoga class, as well as meditation, are all designed to get us to the point where we can be blissful in the present moment. Our mind is often like a TV set with 1,000 channels. The mind is sending us images about things from our past that are done and we can’t change. So why are we worrying about something we can’t change? Our mind is also sending us messages about things that are causing us to worry, such as a task at home or our office that we need to do, maybe it is an upcoming event in our lives, and so many other things. When we fill our minds with all these images from the past that we can’t change or from the future that isn’t here yet, we cannot find peace and calmness. We must always be in the present moment because it is the present moment that we can control. It is in the present moment where we can reach peace. It is not easy to turn off that TV set in our heads with many messages. Meditation and asana practice does help. At Moonflower Yoga, our great instructors often remind our students to be in the present moment and enjoy their present practice. An example of a wonderful yoga class that helps you accomplish this is our candlelight restorative class. In these candlelight restorative classes, students spend several minutes deeply relaxing in various postures with the help of bolsters, blankets, and other props. These long, relaxing postures in a very supported restorative manner enable you to relax and let go of the TV set images in your mind. Students often walk into the Moonflower Yoga studio feeling stressed from the daily pressures of life. When they leave after a great yoga class, the transformation can be amazing. It is incredible what can happen when we let go of those TV set images from the past and future and just breathe deeply and live in the present moment. If you are in the area of Bellmore in Long Island’s Nassau County, I encourage to stop by the Moonflower Yoga studio to try one of the great yoga classes where we practice being joyful and present. You will be amazed at the transformation that can happen when you calm the changing fluctuations in your mind! Tags: asana practice, Bellmore, candlelight restorative yoga, great instructors, great yoga classes, Long Island, meditation, Moonflower Yoga, Moonflower Yoga studio, Nancy Weshkoff, Nassau County, Patanjali, what is yoga, Yoga, Yoga Sutras.